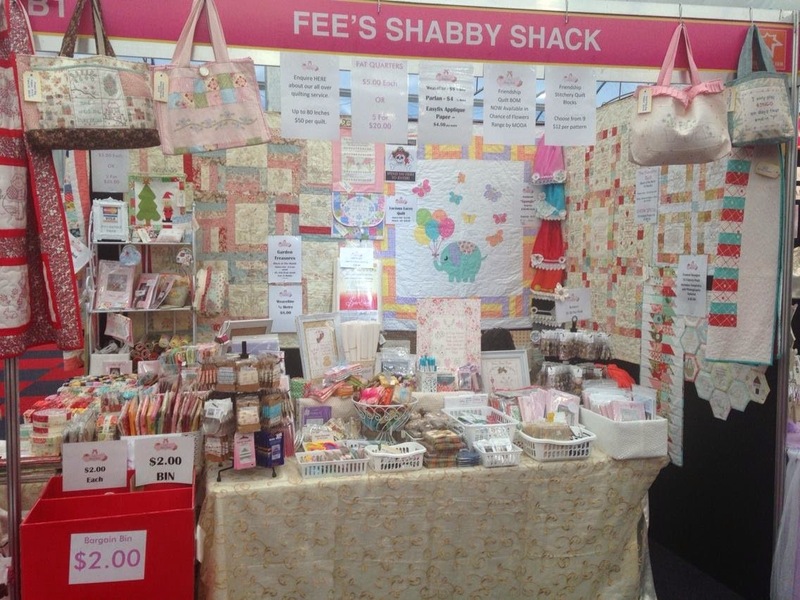 The Sydney Craft & Quilt Fair is over and after a successful trip and meeting many lovely customers I am now back home. 1. - I am a home body and 1 week away from my hubby and family is 1 week too long - I was terribly homesick after day 3. 2. - My back injury which has been dormant for many months reared it's ugly head and reminded me that I am not able to do the things my brain thinks I can do !! 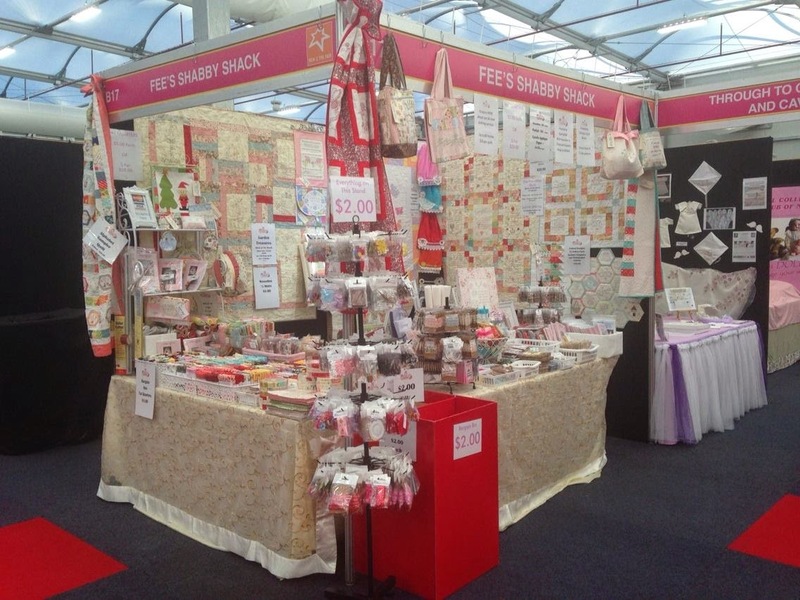 I still have the Hobart Craft & Quilt Show to go next week. After that I will consider the path the business will take in 2014. It's exciting to have options. We have been saving for quite some time to have the rest of the house renovated. As much as I like my pine lined home I have been dreaming of painting the entire 32 squares white for the longest time (8 years in fact) so 4 months ago I booked the painter to paint whilst I was away at the shows as I knew I would get very stressed with the house upside down and me trying to live in it. Disaster struck when the painter ditched our booking for a better offer ! To say I was unimpressed may have been an understatement. BUT I believe everything happens for a reason and I was able to book another painter to begin whilst I was in Sydney. He started on the foyer and the formal dining room. 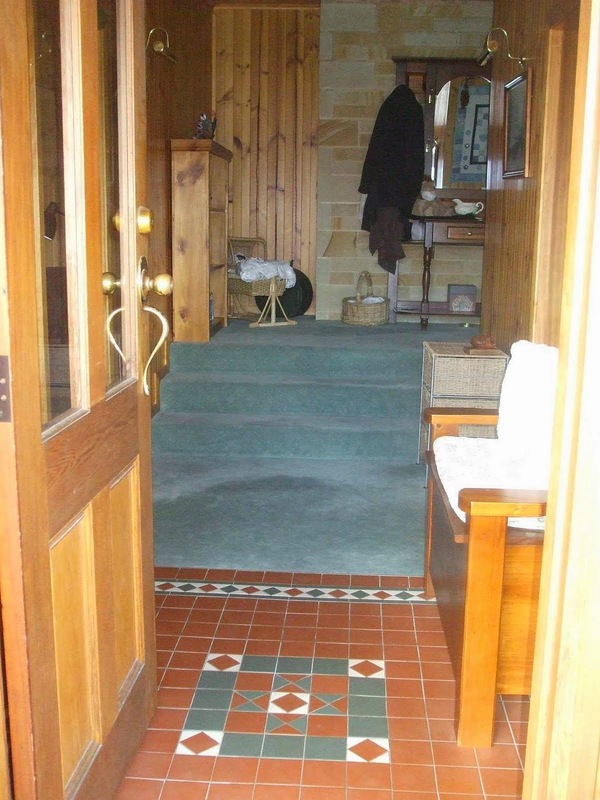 I had forgotten to take before pics of the entrance to our home but found these past blog pics which shows you the area. Our home has a lot of character and was the main reason we fell in love and bought it 8 years ago but the wood is so dark and dreary and my white and shabby accessories just don't look that great with it anymore. So it is time for a major change. The dining area has lovely bay windows and is sunken so has a litter stair way and bannister leading to it - I love this room ! I'm pleased to say that on my return from Sydney these areas were finished and the new painter has exceeded my expectations - His neatness and skill is astounding ! So much so that he begins the remainder of the house that is unpainted (4 rooms) on Monday and I have also booked him to re-do the bedroom wing of the house that the previous painter had painted last year - The comparison in workmanship is no comparison. I'll be back over the weekend to show you the after photo's. You will be amazed ! Oh it will be lovely in white...a big job - i'll bet you are pleased soemone else is doing it too. Would have loved to haave seen your stall...I know Brisbane is a loooong way, but we'd love to see you and your goodies. Your home is just beautiful....glad you had success at the craft fair. I love, love the style of your home, stunning. Can't wait to see the new look when completed. Tae Care. I'm so in love with your dinning room area. It looks super in the after photos too. We have found a really good painter/ decorator who is gradully doing our house room by room. It takes time nd money but the results are so worth it. Hugs Mrs A.